Can I use (LaTeX?) packages from CTAN in plain TeX? LaTeX (and other environments) is a set of compiled macros written using TeX primitives. 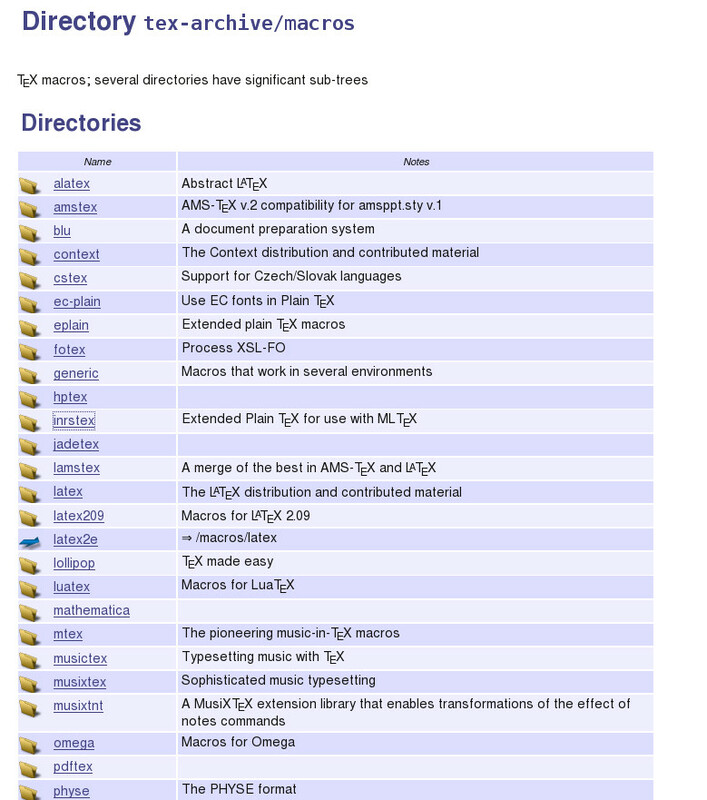 Lets say MikTeX can organize those macros in local repository so I can reuse them in my LaTeX document. But I am still not sure if CTAN contains packages for LaTeX or for TeX. Are they written using built-in LaTeX macros or written in pure TeX. If the second is true can I use those packages in plain TeX using \input? How should I organize macros from CTAN just download and put into the same folder with my document? Is there any package manager for plain TeX? It is possible to use some LaTeX packages on Plain TeX (graphics, color and hyperref, for instance), by faking some functionality of LaTeX; only that necessary to load and make the packages operative. Yet another macro package built on top of plain, eplain, has a built-in ability to load some basic LaTeX macro packages. It is also possible to use some Plain TeX functionality in LaTeX documents with the plain package and the plain environment provided. Still, it's not the whole thing, but works for many things. You can find all this stuff in CTAN, which contains lots of thing TeX related. Beware though that you need to learn how to navigate in the tex-archive tree. The MikTeX package manager deals mostly with LaTeX packages, so you may need to learn how to install Plain macro files manually. This is only a partial answer, as it does not provide the full requested information. There are macro bundles ('packages') on CTAN designed for PlainTeX, listed under CTAN archive and explicitly stated as such, e.g. 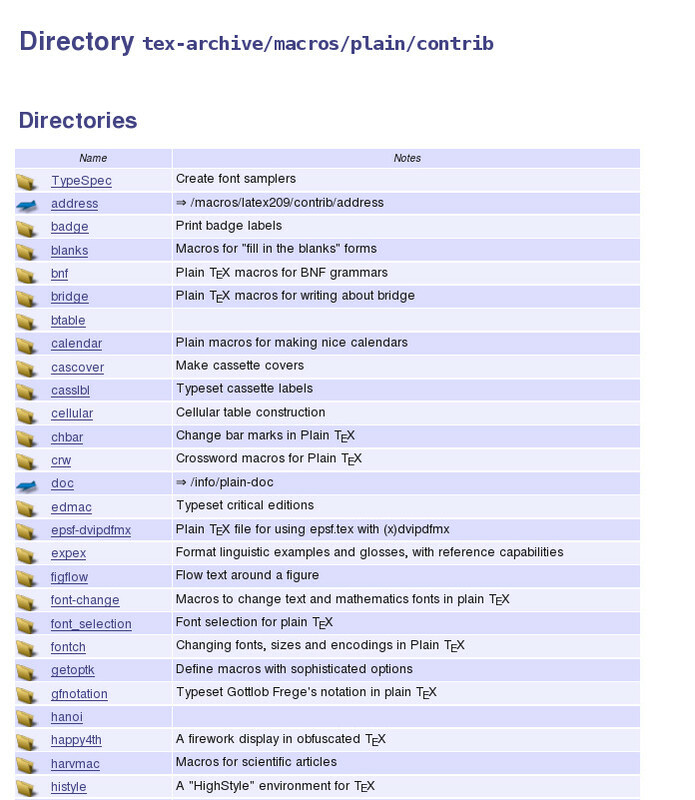 The directory CTAN plain/contrib archive contains a lot of user contributions as TeX bundles. The direct usage of LaTeX macros in PlainTeX is difficult, depends on their complexity to bypass the LaTeX style and boil them down to TeX. Either it's necessary to copy the macros out of the LaTeX package or to use some \let\RequirePackage ... etc stuff to calm down TeX. I doubt that the whole effort to \input LaTeX packages/source files/preambles will gain any profit. The screen shots just show some of the macro directories in the relevant categories. The overview isn't meant to be complete. CTAN is a TeX & friends-related code repository not a LaTeX snob :P. The contents are separated for convenience and maintenance plus a few esoteric details (as far as I know). For example if you look at your MikTeX directory you can see this separation clearly. Because packages are also installed based on this structure. But possibility of using a LaTeX package in plain TeX is up to the author of the package. If you use LaTeX constructs in your package and some plain TeX user wants to use it, then it will fail as the LaTeX macros won't be available. If you use \newcommand instead of \def or other LaTeX constructs like \newcounter and so on then plain TeX user needs to either import the latex style file with input which would be more or less using LaTeX hence futile or rewrite the macros from scratch. Some authors actually check the compilation engine, branch off and decide accordingly during the package import. Not the answer you're looking for? Browse other questions tagged macros miktex plain-tex ctan learning or ask your own question. Installing new packages from ctan through command line or AUCTeX on Mac OS? LaTeX for plain TeX users? Is there a BNF grammar of the LaTeX format?